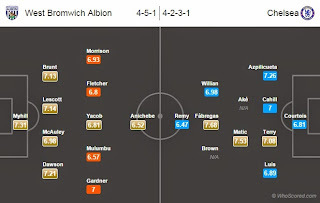 Possible Line-ups, Stats, Team News: West Brom vs Chelsea, head to head record, form guide. Venue: The Hawthorns Referee: Mike Jones, Date: Monday, 18 May, 2015. Premier League Champions Chelsea will play West Brom in an away game in the second last gameweek of Premier League tonight. 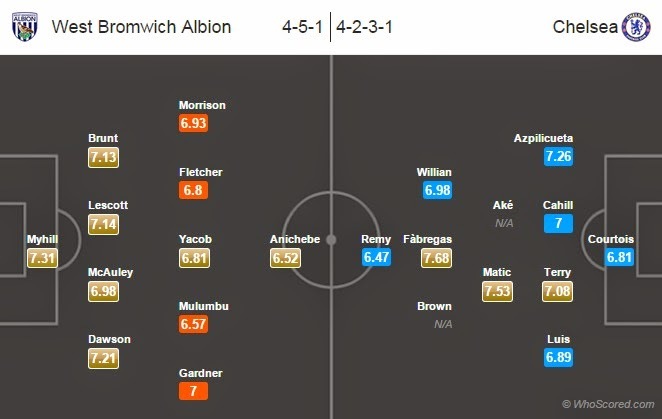 West Brom will be without stopper Ben Foster who is the only player out due to injury. The home side are likely to start with a similar lineup as of the past few games. They are unbeaten in their last four games. James Morrison might come into as he has returned to full fitness. Joleon Lescott and Chris Brunt both will be seen on defensive roles. Duo Brazilian Oscar and Ramires are likely to miss the game through injuries. Kurt Zouma is also out. Striker Diego Costa is doubtful for this game. Stopper Petr Cech who missed last game due to injury will be rested for the final game next weekend which could be his last game for Chelsea. Boss Jose Mourinho is likely to give some chance to youngster Nathan Aké and Dominic Solanke in these last games. Chelsea have won four of their last six Premier League games. West Brom are unbeaten in their last four Premier League games. West Brom are unbeaten against Chelsea in their last three home games in Premier League.